Last week, I was invited on behalf of ALLi to present a fifteen-minute speech on the state of publishing for the independent author at The Bookseller’s Author Day. As I was writing the speech, that sentence kept rising: Every author should self-publish at least once. Having experienced the conference and its follow-up, I now believe this more than ever. Ideas and discussion are of course important to seed learning and change, but it is in doing that we really learn. In the interests of encouraging more writers to publish their own work, we’re reproducing the speech here in my usual “First Monday” opinion slot. “Before I begin, I would like to say that I support every word that Nicola (from the Society of Authors) said and that at ALLi, we don’t work from the divide which Author Day is exploring either. It is a debate, certainly, but in our experience, the most successful writers increasingly choose to move between self-publishing and assisted publishing (whether through a paid service or a trade publisher), and will consider whichever pathways are open to them for a particular project. Indeed, any indie authors successfully selling online will sooner or later find themselves engaging with trade publishing, if only around subsidiary rights. But back to today and “the state of independent publishing” for authors. The alternative title which kept rising for me while preparing this talk was: Why Every Author Should Self-Publish (At Least Once). There are so many myths and misconceptions that are swept away by the act of doing it, and seeing how it feels. I know this because I first self-published very much as an experiment. I had worked for twenty years in writing and media and publishing. I didn’t expect it to be what it was. What I’d like to do today, in the spirit of exploration that is the intention behind Author Day, is outline my view of the author experience in 2015, drawing on my observations as Director of ALLi, and my previous jobs as Director of a writing school and literary agency and, equally relevant, my own experience of having trade-published fiction and non-fiction, with a corporate publisher and an indie press, as well as self-publishing a number of books of fiction, nonfiction and poetry since 2011. For me, that move to self-publishing was the best move of my writing life but my central premise is this: It is no secret that the wind of change is blowing through the publishing industry. Opinion about this change — what it means for publishing, or literature, or readers — is a poor guide to what is best for us, as authors. There are so many myths and misconceptions swirling around this topic, and each self-publishing experience is so unique, that the only way to know what self-publishing means for you is to try it and see. Self-publishing and “independent publishing”, the term used by the organizers of Author Day, are not synonymous as we define them at all. As we see it, “self-publishing” is an umbrella term and the self-publishing community has three kinds of writer, all of whom have different aspirations, needs and outcomes. At ALLi, we give them different names, so we know who we are talking about, and how to best serve them. This group is primarily interested in writing, and though they may enjoy the tasks associated with publishing, they have relatively little interest in the business side of things. They publish their work in the sense of making it public — on blogs, and social reading sites like Wattpad. Or they are publishing a book for family, friends or their own community. For these writers, publication is primarily an expression of self. They may, or may not, produce well-crafted writing and may, or may not, produce well-crafted books — but they are less interested in reaching readers than in expressing something, and putting it out there. Just because it is not always perfectly executed does not mean that the effort itself is not valid, in some cases noble. The snobbery that has traditionally met these writers’ efforts is ill-judged. (Snobbery always is). We all know that writing is magic, a powerful agent of healing and transformation. What is not so often acknowledged is that so too is the act of publication. These are the writers who want to reach readers on an ongoing basis and hope to make a living from their work. If they come to the self-publishing because they see it as a second-best to trade-publishing, they can go through a tough time at first, and may fall away, defeated by the work needed if they are to bridge the gap between what they want and making it happen. Not just the day-to-day labour of editorial and design and social media but the personal growth and change of mindset necessary if they are to succeed. (more on this below). Those who stay the course begin to engage with, not resist, the work of publishing well: working with good beta readers and editors, understanding where their books fit in the wider publishing ecosystem, learning what genres and format and categories fit their projects, finding a voice, discovering what they have to say. This stage is also about finding the tools and techniques and platforms that allow them to publish their book(s) well, and reach readers. It takes the writer on the creative ride of their life and most of need a good deal of help and support from each other, which is where ALLi comes in. At ALLi, we spot when an author-publisher goes indie; it is the moment when success begins to kick in. The authors are now meeting their own creative intentions: finishing the books, reaching the readers, learning from the mistakes, taking the lessons into the next book. Indie authors are the core of ALLi’s membership and I count myself among that tribe. We are “indie”, not just because it allows us to borrow some secondhand cool from the worlds of film and music (though, yes, we book nerds need all the cool we can muster!) but because the indie attitude of mind is core to what we do: our most defining feature, and our most essential tool. Independence in our community comes in varying shades. Some of our members are fiercely autonomous, as DIY as it’s possible to be, actively advocating the self-publishing route for all, and predicting the imminent end of trade-publishing as we know it. While these tend to be most vocal, far more members are very happy to collaborate with a publishing service where that seems advantageous, some working with paid services, others with trade publishers. It’s only a few authors who are so politically motivated by their indie status that they will turn down an offer that makes sense and does good things for their book(s). At ALLi, being an indie author doesn’t mean that you are wedded to self-publishing in every situation. Some people use the term “hybrid author” to describe a writer who publishes books both through trade and self-publishing platforms. We believe the term “indie author” adequately — and best — describes such a writer. So what is the Indie Mindset? An indie author recognizes that publication is not somebody in a publishing house deciding that your book is “good enough”. Publication is seven processes that we need to get right, if we are to publish successfully: editorial, design, production, distribution, marketing, accounting and rights licensing. Thanks to technology, there more ways than ever to approach those publishing tasks. The business model of print books selling in bookstores is not commercially viable for most indie authors. Economies of scale means we currently can’t compete with trade publishing in print. But digital — e-books and POD (print on demand) — delivers a global audience, relatively inexpensive production costs, a point-of purchase at the moment of discovery, the end to “out-of-print”, and a level playing field. Selling well written and published digital products in online bookstores, we can compete on price and the reader won’t know, and doesn’t care, who published the book. We Don’t do “Frontlist” or “Backlist”. We know a book is new to a reader the day he or she first discovers it. If the content isn’t time-sensitive, then we can promote it whenever we want. Titles that might have struggle to sell enough numbers at territory level become viable with a global readership. The big self-publishing platforms like Createspace, iBooks, KDP, Kobo, Ingram Spark and Nook are all global platforms, and are all investing in expanding their global presence — as are distributors like Smashwords, Draft2Digital and PublishDrive. All great news for indies. The indie author community is distinguished by its outstanding sense of collaboration and co-operation. Writers are banding together and supporting each other, as we catch this new wave of empowerment. We are showing each other how to do the tasks we need to do, with minimum outlay of time and money and sharing the techniques and tools, the news and views, that empower each of us write and publish well. We are telling each other about good services (that help us sell good books) and how they differ from vanity outfits (that sell shoddy author services). Indie authors are sometimes criticized for being too supportive and not critical enough. It’s not that we don’t see each other’s mistakes. We know that nitpicking over errors is not half as useful as finding and offering the advice and motivation and support that’s needed to create a good book, finish it off, and publish it well. Actually we love the mistakes. We know that mistakes are how we learn. We’re in a creative environment, learning by doing. So we try, we fail, we try again and, as Beckett said, next time we fail better. Collaboration and partnership extends to publishing services, both paid and trade. The indie author knows that to take advantage of our publishing rights requires partnership and cooperation with author-services, publishers, online licensing platform and literary agents. We enter into agreements with such partners in a spirit of negotiation and collaboration for mutual benefit. We know the more retailers, and regions, and formats a publisher uses, for author-publishers and trade-publishers alike, the stronger the foundation for consistent, long-term income. Abundance is how nature, the fundamental model for all creativity, operates. An oak tree throws a lot of acorns to get one baby oak. What’s important in an abundance model is not how many bad books are enabled. They don’t, as some commentators suggest, “clog up the system”. They quickly fall into the invisible nether regions of the online retailers. What matters is how many good books are enabled. As every author knows, you turn out a lot of words to get a book that’s good enough to put out there. Yes, there are exceptions, those few books that arrive and write themselves, but generally speaking, the more pages that have hit the trash can in the making, the better the book. And it’s the same with publishing (with everything, actually). The more, the merrier. And the author who publishes a “bad” book today may well be on the way to writing a better one next time. Writing and publishing are both creative skills, learned by doing. Practice can and does make… if not perfect, then certainly better and better. We recognize are central to a revolutionary shift in publishing, which needs to move from seeing the author purely as a resource (in the new parlance “content provider”) to respecting the author as a creative director with much to offer in each step of the publishing process. We are proud of our indie status and carry that self-respect into all our ventures, negotiations and collaborations for our own benefit and that of other writers. Professional, motivated, resilient, determined and hardworking, indies are the kind of authors that trade publishing most wants to work with. The irony is that these are the kinds of writers who find trade publishing systems most frustrating — particularly the inequality of the working relationship that gives them poor terms and conditions, and refuses them creative input into key decisions around cover design, branding and marketing. Restrictions around format and pricing and overly long publication lead times are also off-putting when compared to the far more favorable terms and conditions offered by the Big Five self-publishing services: Amazon, Apple iBooks, Kobo, Ingram Spark and Nook and distributors like Draft2Digital, Smashwords and PublishDrive. But it’s not all day-long laughter in indie-author land. There are challenges. With all our newfound freedoms come more responsibilities. Education is needed to convince authors of the absolute need to invest in good, qualified editors, in particular, and the other publishing processes. Reaching readers is a tough challenge for all, especially those in over-supplied and under-read genres like poetry, literary fiction, memoir and narrative nonfiction. And good author-publishers also understand publishing rights and how to sell them. When we hire our own editors, design and production people, we may not be challenged enough by those around us. Motivation and encouragement are primary during the first four stages of the writing process but there comes a point when critique becomes essential. We need to ensure we set ourselves up to receive it from the right people, at the right time. The wider publishing world has yet to open up to indie authors and that can be hard. We would like to be part of the wider publishing ecosystem. We would like to be in bookstores, at literary festivals, (as authors, not as self-publishing authors) and we would like the assumption that we self-publish because we can’t get a “proper” publisher dissolved. This may be true of some authors but it is certainly not true of all. So to answer the question inherent in the invitation to speak here today: the state of the independent author in publishing is happier than it has ever been. Power has shifted in our industry towards authors, and if we want to claim that power we have to claim the responsibilities as well as the freedoms. We have to step up and do the work. There are challenges, as we have seen, but we have come so far, so fast. And we’re only just beginning. The wind of change is blowing. It is a fair wind. Thank you for sharing! I enjoyed learning about the different types of authors that are out there as well the descriptions that went along with them! Thank you, Orna, for the best explanation of indie-authoring I’ve read. For more than two decades our membership-based group of indies (Fresh Ink Group) has been supporting each other with adaptive planning for managing our literary careers, including publishing for the past ten years. However, in the past year people are increasingly coming to us full of misinformation, myths, scam-warnings, and worse while trolls whisper “they’re trying to take advantage of you” in their ears. Yes, bad choices and bad players abound, but that means we must learn to discern what works for each of us. Painting entire industries with broad strokes based on lies or one’s own limited exposure is never smart, yet the self-styled experts traffic in spreading damaging information. I wish more would read your comments before talking to us. Then we could explain why some don’t fit in our group, and why others do, and offer our experience and often professional expertise without starting from suspicion and ignorance. We started doing this our own way because we decided our way would be best for us. You get that, Orna, and dare I say maybe even respect it. So, again, thanks for being that voice of reason. Writers who self-publish do it primarily to take complete control of their publishing life. Serious self-publishers strive to produce well-crafted books, and they are very interested in reaching as many readers as they can. They have the opportunity to do this because their books—unlike traditionally published books—are not filtered for content and subject matter. They can also keep a book ‘in print’ for years, whereas traditional publishers put books ‘out of print’. Self-published authors work to make a living out from their books because unless you are in the top crust of book-selling authors, you won’t making a living if you go the traditional route. Not only do self-published authors strive to reach this goal, many do. Self-published authors are also called independent authors, independent publishers and indies. As a self-published, indie author, I publish both eBooks and paperbacks. I sell many at markets, at shows and in person. My next step is to get paperbacks into independently-owned brick stores. I have some self-published author friends who do this already. I agree; we think globally and regionally, but I put more emphasis on regionally because I sell many books to readers in my own province through face-to-face meetings. Yes, we do support each other. We share information and help when other self-published, indie authors need it. Thank you Diane and apologies for the delay in replying… I agree we can all use these terms differently… this is just the way we think of it, that allows us to keep our members and followers straight in our heads, and meet their needs. All of these terms are fluid and there isn’t any right answer. 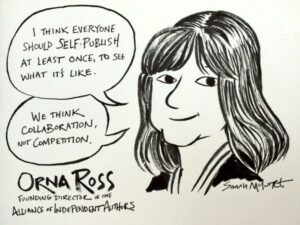 I liked your post on the 5 kinds of publishers and completely agree that hiring a vanity service is different to self-publishing — and that there are some awful services out there. But we have members who choose to use self-publishing services who are very happy with them. http://selfpublishingadvice.org/opinion-why-i-dont-diy/ Every author is different and definitions aren’t easy! Thanks for joining our conversation! There is one particular point that you make in this article that really struck home with me. In the past I have referred to myself as a “hybrid” author – meaning that I publish both through traditional publishers as well as independently publishing my own work. I mean it sounded cool – right? Almost like calling myself a Transformer. Maybe this is an antiquated concept. I mean really – when you stop and think about it, I publish my work independently because it suits my purposes. I likewise publish my work through a traditional publisher – BECAUSE IT SUITS MY PURPOSES! Either way – that is an independent decision that I make – and therefore maybe it is time to start calling myself an indie author – first and foremost. But I am STILL a Transformer, dang it! I agree with most of the comment above. As the late JL Carr (A Month in the Country) said, ‘Everyone should try to sell something.’ Meeting real people is better than throwing a bottle with your message enclosed into the ocean. Speaking as a new author who has used a publishing service? I found the printed version of your speech illuminating and like a breath of fresh air. The one thing that being an ‘Indie Author’ does for me, as is well illustrated in your excellent speech, is that it gives me hope! I have done the rounds of contacting various agencies who often use the quote of ‘ I enjoyed reading your chapters but they were not for me’. This as a fledgling author, says everything, but tells you nothing! That god for organisations like ALLi and their welcoming sense of camaraderie and do know what? You are so right Orna in the words of Bob Dylan, ‘The time they are a-changing’. Sorry for my ‘up the establishment’ rant. You’ve fired me up so I’m off to finish book three. I’m so glad I joined this organization! I’m still working on completing my first novel, but it’s posts like these, and the opinions of authors like yourself that help confirm my commitment to go the indie route. I vacillated for a while on this decision, but time and time again, when faced with insightful descriptions (such as the one above) of what it means to be an indie-author, I realized that, at my core, I’m indie all the way. Fear and worrying about how I’d be perceived by others were the two biggest reasons for my indecisiveness. Reading posts like this ignite me in a way that burns some of that fear away and remind me that I was born to be an indie-creative. Thank you! And thank you Grace Denise, for your efforts and self-awareness. “Born to be an indie-creative”: love that! Great summary of the indie life and challenges. I would add, that many years ago I turned down a contract with a big publisher because I didn’t like the compromises I would have to make. At that time, indie was viable, so I worked with small presses. I’ve also worked with mid-size trad press. While I had some really good small press publishers, I also had some nightmare ones. When my last publisher closed, I had offers from other small presses, but I’d done the one-book try of indie and was hooked. Thanks Pauline and thank you for being a member of ALLi and all your helpful posts and contributions. I totally agree that the joy of being the creative director of our projects greatly outweighs the challenges. Going indie was the best move of my writing life and has brought me places I hadn’t even begun to imagine. Like you, I’m hooked. Wot larks! I could not agree more. All of the above. Amen. And let me add my small “yop!” to the chorus of established trade published authors who have a choice on a project by project basis and are now choosing to go indie. 1. I am very open to help others. I have guided a number of people through self-publishing, turning down one $10,000 check for that help. I connect writers with experts in some specific fields so they can get their work checked. I offer advice on forums when asked. But as a whole, indies tend to be too kind. Indies go on and on about how poor works by self-publishers “ruin” the market for the rest of us, but every time some illiterate poster complains on the KDP forum, for example, that no one bought his book, only a few people will dare say that the so-called book (of 30 pages) really just isn’t good at all. Some of these are pretty obviously people who cannot write but are looking for what they think will be a quick buck. Yet other posters encourage them with “you’re a great writer, keep on writing.” Encouragement is great, but at the risk of sounding elitist, I think it woulds be given to serious writers who are concerned with their craft, not just making a buck. 2. It is easy to write “we would like the assumption that we self-publish because we can’t get a “proper” publisher dissolved.” But in reality, isn’t that the truth for the majority of us? I published exactly one piece of fiction in 35 years. Quite a bit of non-fiction, but only one short story. I submitted my first novel to more than a few agents and publishers only to get ignored. So I self-published. I am not ashamed of that. I enjoy writing and am tickled pink that anyone enjoys reading my work. As an added bonus, I make far more money than most trad-published writers. I am an indie writer, something I am neither proud of nor ashamed. I am proud of my books, but the avenue on how my books get to the reader is merely a tool. But I did start self-pubbing because I could not get my books picked up by a trad publisher. The fact that I would not go the trad route now unless the offer was really pretty amazing, but that does not take away the fact that I tried to get a trad publisher to accept my work. Great article! When self-publishing I agree that you need the help of a good editor. But where do you find one. I published my first novel last year and the editor I used was awesome; the only problem was it took her soooo long to do it. I just finished my second novel and it’s now in the editing process with the same editor. She’s had it for three months and I haven’t gotten anything back yet. It’s extremely frustrating. Any ideas how people find good editors? Hi Annelise, Three months is unacceptable. (Hope you didn’t pay in advance.) You have to set the terms up front; writers can’t afford unjustified wait-times—there are too many lulls already in writing/publishing. You could fire her. Or you could pay her more. Either move would get you back in gear. I feel for you, though, since she helped you before, you hate to let her go. I’ve had two editors, one for each for my two published books. The first I found on Craigslist. I picked a region where my reader demographic might reside (San Francisco in the case of “Some Swamis are Fat”), and perused the writing-related service ads. There were lots of editors and I contacted about 4. One was particularly personable and amenable. Once on the phone, I knew she’d be good for me. $50/hour was a lot for me, but she did exactly what I needed, resonated with the book, delivered as promised, and actually became a good friend (that I never actually met). Then she died. For my next book (“I Did Inhale—Memoir of a Hippie Chick”), a bigger project I was emotionally invested in, I offered a retired friend—an avid reader and also my demographic—to pay her to read my book, take notes, and consult me on how I might improve it. She joyfully agreed and her rate was unbelievably fair considering her literary prowess. But she was flattered and thrilled to call herself an editor now, (and our working together ultimately sparked a new career for her as a local reporter). This second editor was really a paid beta reader, but provided exactly what I needed, full of heart and patience. I got to brainstorm at length about my book without wearing someone out, and she got paid to read and help! I believe there are lots of people to help you out. Including good beta readers who might not charge much. Finding someone enthusiastic is key. Both my ‘editors’ were delightful people I joyously acknowledged in the front matter of my books. The person you’ve hired is not hungry enough, not interested enough, or both. I recommend at the very least asking her what the hold-up is about. (The editor of my second book got sluggish later reading another manuscript of mine, and it turned out the war-related references made the reading difficult.) Your editor might have an explanation (?). Hope this shows you can play it any way you want. Best of luck to you! A lucid analysis, and persuasive appeal, especially to the intended audience. Awesome inspirational talk, Orna. I’m a new ALLi member just on the brink of submitting to Kindle Scout this week, but prepared to correct course and go fully indie if it doesn’t work out. That flexible agility is key to author success these days, I think. My climb on the steep learning curve of the last months has taught me SO much, and I’m thankful to be a part of ALLi now. Thank you for sharing your voice–our voice. thank you, Cindy, for being part of our alliance. Every member makes us stronger. Excellent article, Ms. Ross. This is my first year – well actually next June 2016 will be my first year. I have written three novels and published four ‘books’, the latest being a combined book featuring all three novels rolled into one cover for the holiday season shoppers. The issue of marketing can be daunting. I would warn anybody wanting to make a living being ‘indie’ to start with a sizable bank account. Best of luck and Happy Holidays. Indeed! Like any business, marketing books calls for investment and any money spent must be spent wisely. Many of our members invest more time than money, especially at first. And we advise writers not to invest a penny in marketing until they have worked out who their reader is and what they are offering them. Money helps only if it is spent on the right services… of which there are few. Thank you for reading and commenting!